A couple of weeks ago I went to one of Cari Cucksey's estate sales. It was in a HUGE old house in one of the grand old neighborhoods of Detroit. I really just went to see the house and didn't want to spend any money, but alas....I ended up with a haul. It will take me weeks to make something from all of the stuff I brought home. If I had had a lot of money I could have bought some beautiful things. They had at least 15 gorgeous chandeliers for sale. This particular house is going to be on her show next season, so maybe you will see me and I will become famous! One of the things I bought was a little 5 drawer chest that I thought I could use in my very small foyer. It didn't work so I had to come up with another place for it. 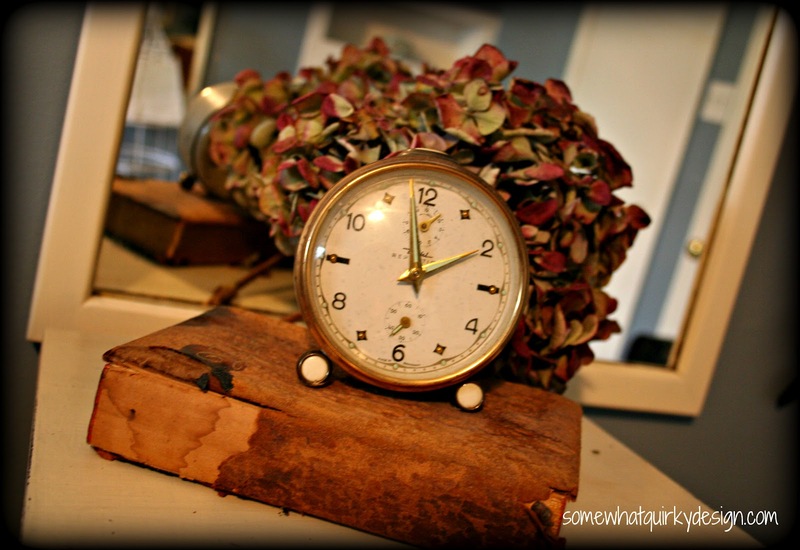 I decided I would paint it to use as part of a bedside vignette in my master bedroom. My bed is really tall and assuming so it is hard to find bedside items that don't get dwarfed by the bed. By itself the chest does get dwarfed, but I think that with the rest of the items in the vignette it is OK - at least for now. This chest is what I call "crap furniture." You know, decorative furniture like you find at Kirklands and stores like that. Shabbily built with low quality materials and undersized drawers etc. I bought it because it was cheap and would likely clean up nicely. 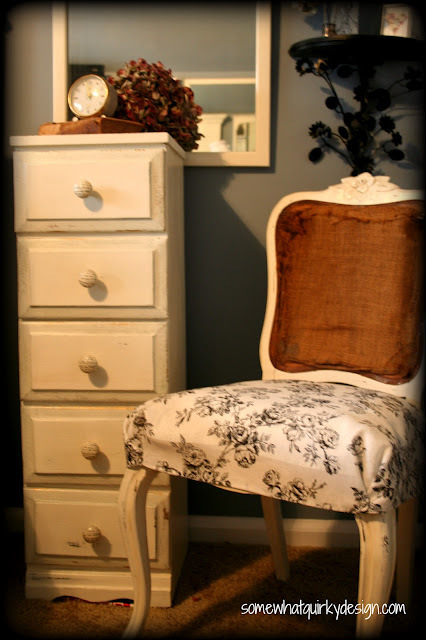 I painted it with the Vintage White CeCe Caldwell paint that I use for the chair I rehabbed last week - and that will sit beside it in the room. Two coats, then distressed with a slightly dampened wash cloth. 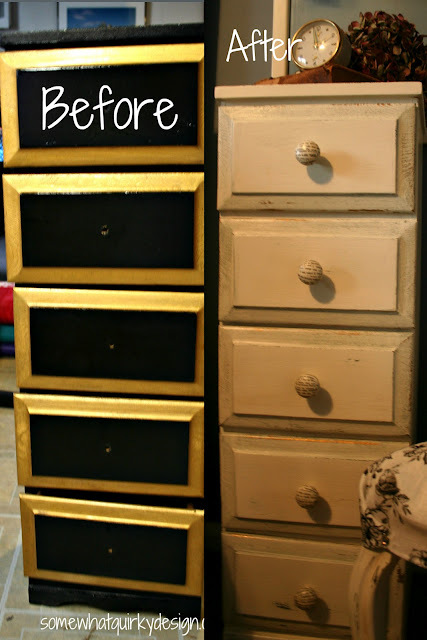 I liked it that the gold paint on the drawer edges showed through nicely. I made a mixture of CeCe Caldwell Smoke Mountain Gray and clear wax and applied it to the borders around the drawers. Then I waxed the whole piece with clear wax and a very light brushing of dark wax. I didn't like the knobs, so I took some spare white porcelain knobs and covered them with strips of old book pages. 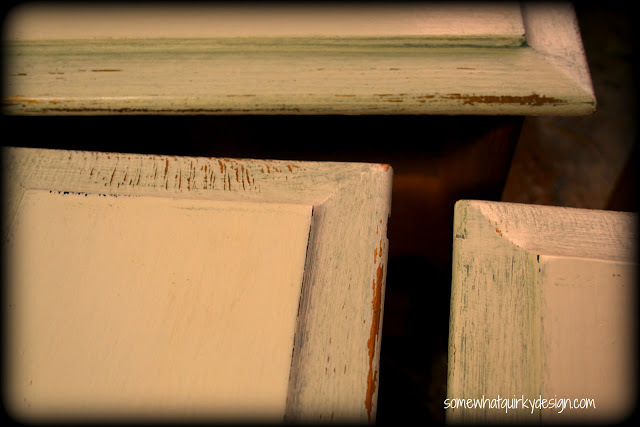 I used ModPodge and then several coats of Deft Clear Wood Finish in Satin. This made a nice coating that left the knobs with a smooth, glass like finish. I buffed the whole thing, put the new knobs on and it was good to go. I didn't do anything special to the insides because it was very clean and frankly I didn't want to do the work. She looks kind of pretty hanging out there with her sister. As a little side note: this entire vignette cost $30. 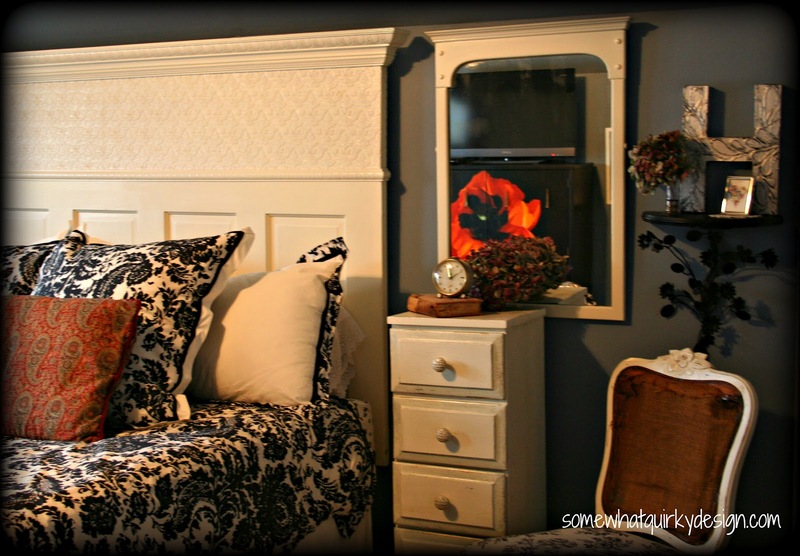 Not bad to go up next to my $35.00 headboard! I like it a lot and don't think your bed dwarfs it at all. Great job! Karen, thanks for stopping by my blog. 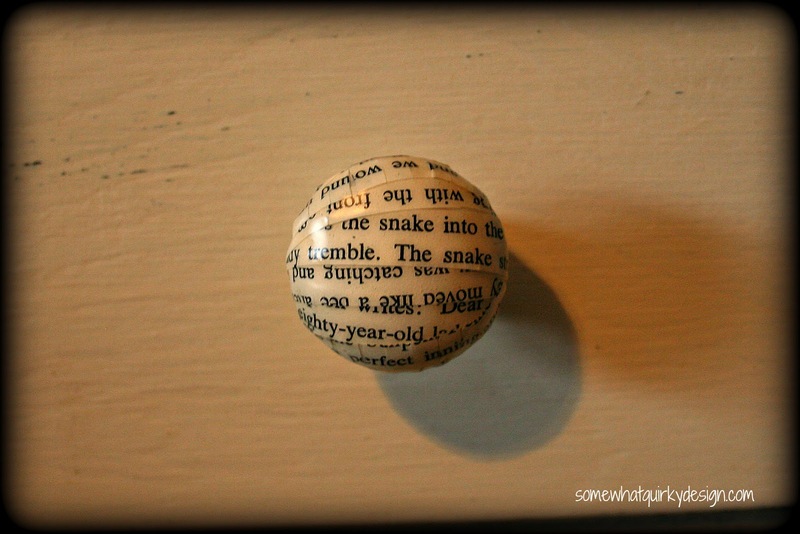 I love the idea of putting the words on the knobs. Brilliant idea! Such creativity. The chest of drawers looks perfect with your bed too. Great work! The whole vignette looks great Karen. 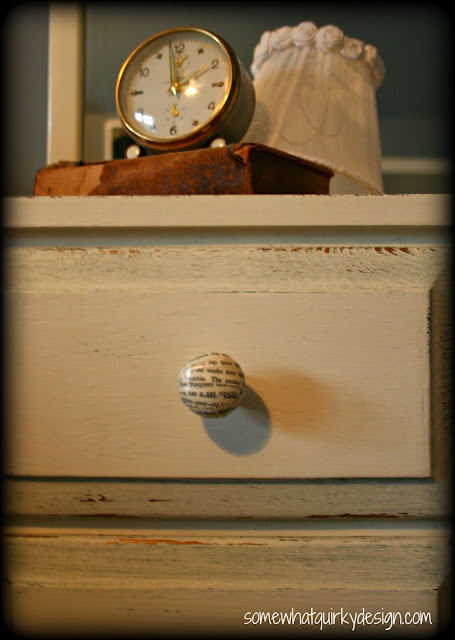 I love the white of everything against the walls, and the knobs really add something to your lovely chest of drawers. Your piece of "crap furniture" is now crapulicious! I love the knobs you made! Great job, Karen! I'm now following you too!!! 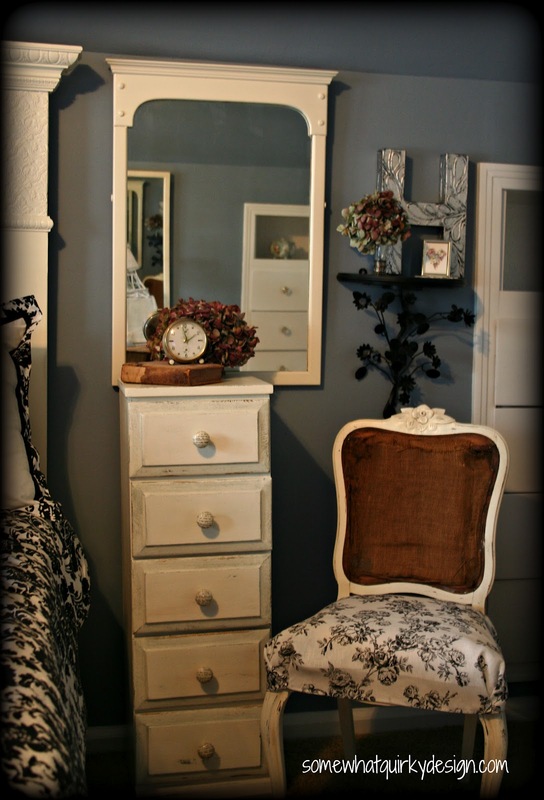 I love that little chest of drawers - oh how I hope to find one just like it! Love those knobs, too, great idea! That looks Great together! Not dwarfed by the bed at all. Love those drawer knobs- great idea! The vignette is not only perfect together and the scale is right on ... I love the price tag! How fun to go to a Cari estate sale! Love the chest you brought home, especially the way you transformed the knobs. How clever! Visiting from The Delectable Home linky party. Happy Monday. I love your style. Great Job. Your tall chest is perfect beside your bed with the other accessories around it. You clearly had a vision and it turned out perfectly. Your vignette is so cute! Love everything, you gorgeous chair, dresser (love her height), H etc. The area seems very calming and turned out perfect. Very nice job! Thanks for sharing your creative inspiration over at Sunday's Best! Totally fabulous! LOVE everything...especially the price. U DID GOOD! I had to pin your drawer knobs. What a great idea to cover them! 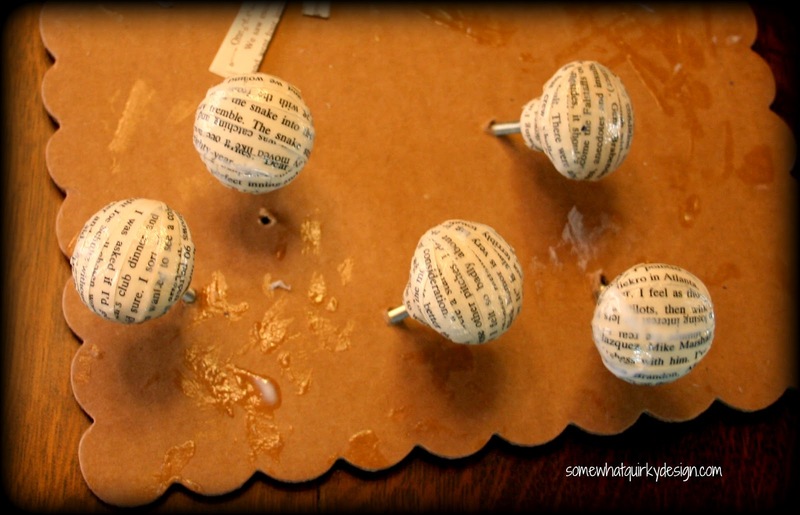 I love your finished product, and I love, love, love how the knobs you did go perfectly! Yea for paint! The whole piece turned out great, but I especially love the knobs. Thanks for linking up! That looks fabulous and I love your knobs! Thanx for joining THT! I'm here from Kathleen's White Wednesday post. What a beautiful vignette you have put together and what an amazing job you did with your little chest of drawers. love the knobs: they are absolutely brilliant! This is cute. This is really cute. Love the knobs. Love the picture with the chair and mirror. I ordered my Caldwell paint from Bungalow 47. I'm almost out of Hershey. This turned out so pretty! I love the knobs, too! Thanks for sharing with us this week!